Urbanisation has become a powerful force in the world and we now live in an era where more people live in towns and cities that ever before. The role of cities as drivers of economic growth has become increasingly important as the world becomes more urbanised. Cities are some of the most important sources of job creation and wealth generation. It is in cities that goods are produced and services are provided that reinforce economic opportunities on a much wider scale (SACN, 2012). Cities in South Africa have also grown rapidly due not only to the obvious economic opportunities and employment prospects, but also as people view cities as potential places where livelihoods can be improved as people also seek better access to services. Cities therefore also carry an important role when it comes to social transformation – they are also centres of artistic, scientific and technological innovations, of culture and education. Due to its often rapid development, cities also carry development burdens – keeping pace with the high infrastructure demand and high number of the poor also moving into cities and arising social tensions. To assess the progress made by South African cities in the last 20 years in relation to development outcomes as well as to identify strategic problems and opportunities facing cities, the South African Cities Network is producing the latest State of the Cities Report. 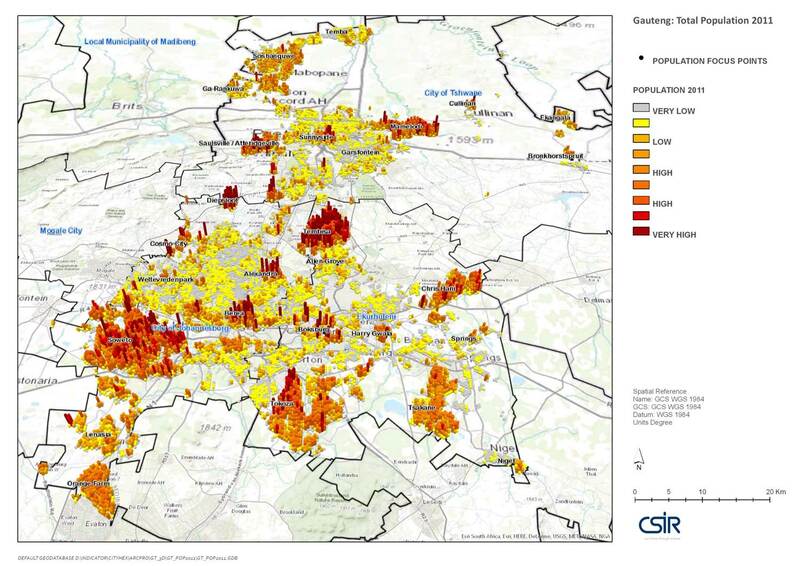 To support the analysis process a number of spatial indicators and or indices have being compiled by CSIR for the SACN during 2015, each illustrating a specific component of change or transformation. A new series of data sets has been developed depicting economic and demographic information using a single sized fine grained tessellation. There are several advantages to this approach; it provides less zone size distortion of information and generalisation. It also enables various forms of transects to be drawn. The most value has however been gained from depicting information using these small unit three-dimensionally. City values are depicted against a contextual map background. A hexagon tessellation (a hexagon being 15ha in size) was created for each metro. A CSIR developed algorithm was used to re-assign the population totals from the three census years (1996, 2001 and 2011) to the hexagon layer. The algorithm uses different secondary spatial datasets as input and is designed to disaggregate large area population data to smaller areas in such a way that it represents, or tries to represent, the original underlying statistical surface (see dasymetric mapping) as closely as possible. negating the MAUP effect, which is a problem when using mapping units created for sampling purposes (like the census demarcations). The location and size of the units being used (hexagons) are also consistent for all three time periods, which allows for easy identification of density variations (growth or decline) in specific areas / localities in a city over time. In the past using more detailed information for cities and settlements was often overlooked due to the expediency of using more summarised units such as Local Municipalities. This has made understanding or detecting change within such an area difficult. Viewing space through a finer place-based lens helps to detect patterns and trends not observed when looking more generally. Simply put, a place-based focus tries to differentiate between places across geographic space. The constraint often faced with current fine-grained spatial units, such as sub-place, main place, wards, voting districts and small areas, is that they do not as a whole remain constant. Because of changes over time information presented through such items cannot be directly compared. Similarly to the approach used in the section above, a dasymetric mapping /data partitioning process is required to enable comparison over time. It is also important to utilise existing information units such as sub-place due to the information available at this unit level. The following reflects a number of information items at sub-place level extracted from published statistics, and applied to present a number of variables. (Note items used are not exhaustive and will be added to). The items have been used to create several maps prepared as inputs to the 2016 State of the Cities Report. A number of items have also been placed into a sub-city spatial viewer that reflects information for South Africa’s nine biggest cities. 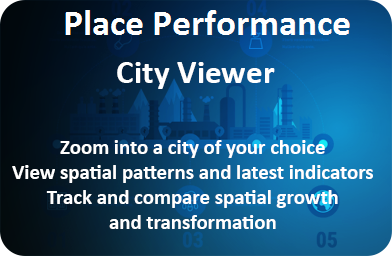 The viewer enables multiple comparative views for a selected city. 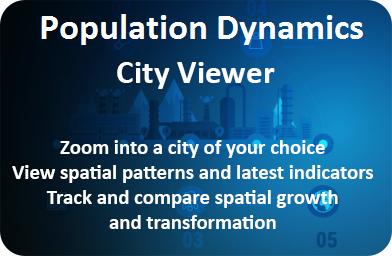 Two groups of data items are featured namely place-based and population dynamics. Some of the above indicators have been available through information provided by statistics South Africa. Some items are new and can be considered ‘indicators in development’. These items are being explored to support analysis to determine spatial change and transformation. For more information, feedback or for collaboration on these items please contact the StepSA team listed below. These items can be accessed through a map viewer.